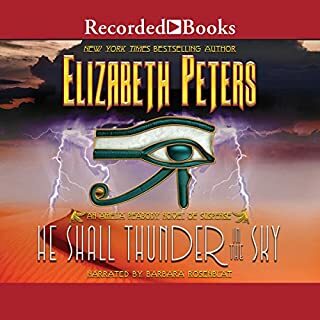 Elizabeth Peters brings back beloved Egyptologist and amateur sleuth Amelia Peabody in an exciting tale set amid the ancient temples and simmering religious tensions of Palestine on the eve of World War I.
August 1910. Amelia Peabody and her husband, Emerson, are relaxing at home in Kent, enjoying the tranquil beauty of summer. But adventure soon beckons when they are persuaded to follow would-be archaeologist Major George Morley on an expedition to Palestine. 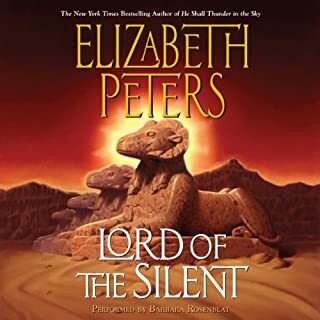 Searching for the vanished treasures of the Temple in Jerusalem, Morley is determined to unearth the legendary Ark of the Covenant. The skeptical Emerson wants no part of the scheme, until a request from the War Office and Buckingham Palace persuades him to reconsider. The Germans are increasing their influence in Palestine and British intelligence insists that Morley is an agent of the Kaiser, sent to stir up trouble in this politically volatile land. Emerson can't believe that the seemingly inept Morley is a German spy, but could he be mistaken? Determined to prevent a catastrophically unprofessional excavation that could destroy priceless historical finds as well as cause an armed protest by infuriated Christians, Jews, and Muslims who view the Temple Mount, also known as the Dome of the Rock, as sacred, Amelia, Emerson, and company head to Palestine. Though it is not to her beloved Egypt, the trip to Jerusalem will also reunite her with her handsome and headstrong son, Ramses, working on a dig at Samaria, north of the holy city. 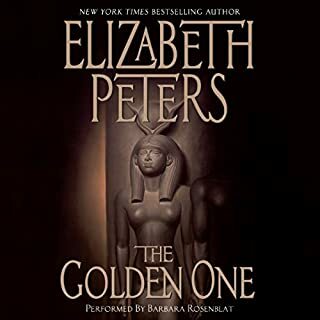 Before Ramses can meet his parents, however, he is distracted by an unusual party of travelers who have arrived in Samaria, including a German woman archaeologist and a mysterious man of unknown nationality and past. 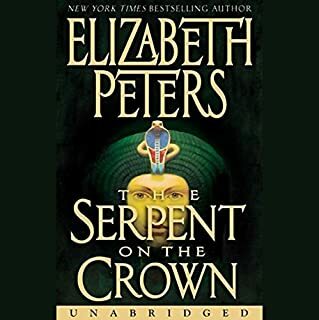 Unfortunately, Ramses's insatiable curiosity and his knack for trouble lead him to a startling discovery: information he must pass on to his parents in Jerusalem, if he can get there alive. This book is like putting on a favorite pair of old slippers. The characters are familiar, this time in a new setting, the plot unfolds in a satisfying manner, and the narration is excellent. I have to disagree that Barbara Rosenblat didn't do a good job. She did her usual excellent job, even with various accents. She did put a bit more emphasis on the "H" in Manuscript H than in previous books, but it wasn't annoying to me. Great literature it's not, but it is a satisfying read. Even despite some technical difficulties (the first downloaded section of the book did not break into chapters and would "bounce around" on its own), I found this book to be very enjoyable. There can be NO other reader for this series but Barbara Rosenblat. She really brings the characters to life. How she does the different characters (eg, Emerson, with his harumphs et al) is a mystery to me. Thank you both again for such a wonderful series. I love the Amelia Peabody series! 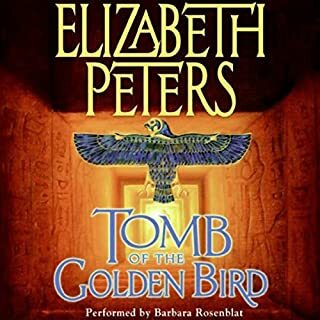 I hope Ms. Peters continues it awhile longer with Barbara Rosenblatt reading. She really brings the characters to life! 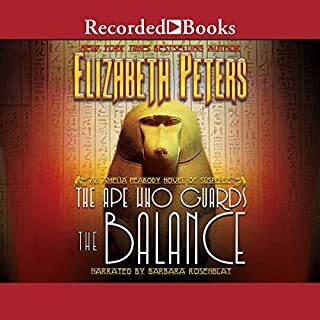 I have loved every single Amelia book and every narration by Barbara Rosenblat, but I was kind of appalled by the narration of this one. I don't know if the problem was with the direction or if the reading just wasn't practiced enough, but there were these long, tedious, distracting pauses during the dialogue, particularly during the "Manuscript H" sections. 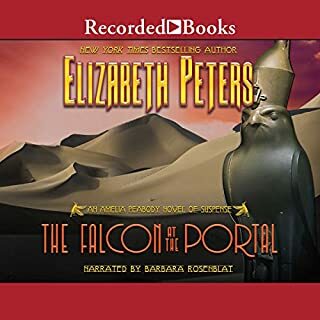 If I hadn't already listened to Barbara Rosenblat read 17 other Amelia books with vim and vigor, I would have blamed the lack of energy in this book entirely on the narration. 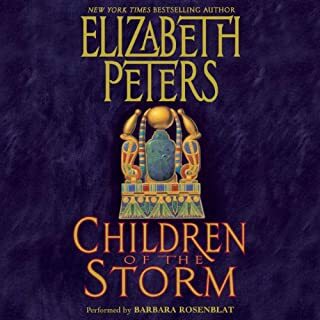 The book started out with promise, I was chuckling along as the characters reestablished themselves, but after about the first hour I found myself having a harder and harder time staying focused on the story and characters because the reading was unnaturally slow and the syntax was absolutely awful in sections. I'm inclined to think that the story was about average for an Amelia book, not one of the best but a good mystery anyway, but because it was difficult to concentrate on the narrative thread, I found that I didn't really enjoy it as much as I was hoping to. Die hard fans will still get something out of it, but if you are new to Amelia PLEASE PLEASE do not start with this one! Go back to the beginning with Crocodile on the Sandbank and experience the magic from there. By the time you get to this one, it will be possible to (maybe) overlook the problems and enjoy reconnecting with the characters at least. I love the Amelia Peabody books and have read and reread them for years. 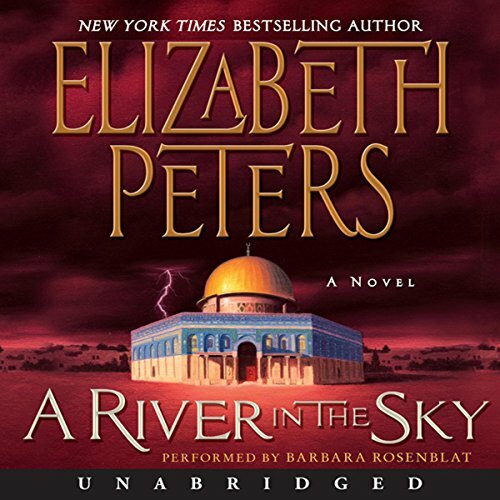 Now that I have many of them in audio form, I have listened to them yet again, enjoying every moment of this heightened experience.I didn't realize until a few days ago that I had never read A River In The Sky. What an oversight, I thought! And yet, I was excited that I had a "new" Amelia book to enjoy!I found Barbara Rosenblatt as entertaining as always. Her vocal acting is very good, and extremely expressive. Her voice has.matured, but that fits the characters.The book disappointed me. Many scenes and interactions seemed forced, without the banter and ease other books. I didn't care for the plot in general, and taking the characters out of Egypt was a mistake. 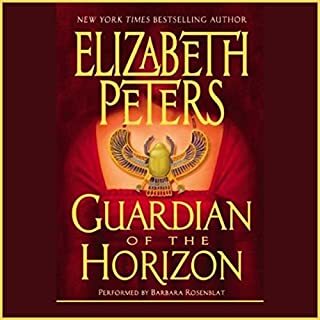 I didn't care for the Lost Oasis stories, either, except that they gave us Nefret.It was an okay listen, but this will be my trying-to-go-to-sleep option, if anything, in the future. What made the experience of listening to A River in the Sky the most enjoyable? 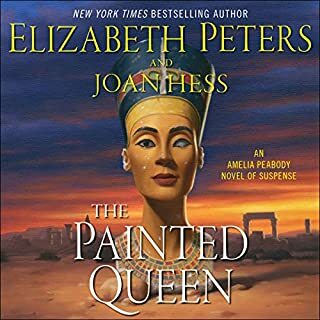 Very good narrating as always but this story takes place before both Ramses and David were married. David was engaged at the time. Really don't know where this story falls in the series, but not 19th. The supreme Barbara Rosenblat could not save it. I could hardly get through it it was so lack- luster. It tried to be conversationally witty, but the charactors we have all learned to love were not the same. The story line was boring. 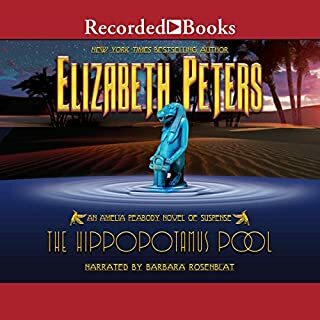 I hope everyone else feels differently, but I have listened to and loved all nineteen other Peabody-Emerson adventures and couldn't get into this one. 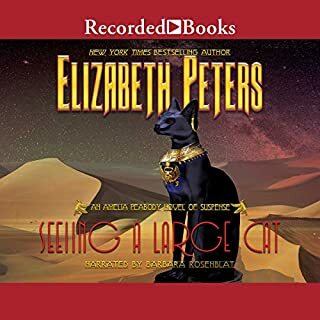 The combination of Elizabeth Peters and Barbara Rosenblat never fails to hold my attention and leave me wanting more! If you like light mystery with a chuckle here and there, you owe it to yourself to read this entire series! Not up to the usual standard.. I impatiently waited for the next installment in this fun book series. I was disappointed that this did not pick up where the last book left off. If you think that this book carries on in chronological order, it does not. It actually dates many years earlier. That was the first disappointment. I agree with other reviews that the narration was not nearly as good as usual. The book did drag after a while and I had to make myself finish it, just in case it got better! As mentioned in other reviews, if this is your first purchase in this series, start back at the beginning with Crocodile on the Sandbank and learn to love these characters as fans of the series do, then you will be able to overlook #19 and again wait for the next installment in this series. This is as entertaining as all of the Amelia Peabody books. I have enjoyed listening to every book. Barbara Rosenblat is the best.